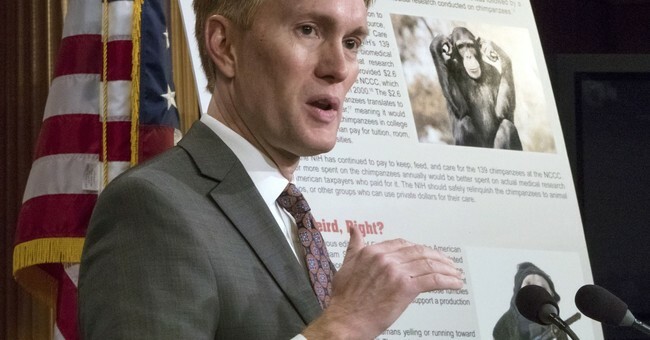 Sen. James Lankford (R-OK) released his annual “Federal Fumbles” report Monday detailing 100 ways the government is wasting taxpayer money through spending and harmful regulations. The report identifies $473.6 billion spent on wasteful projects or in an inefficient manner. This year’s report includes a “touchdowns” section that applauds the government for addressing wasteful spending identified in Lankford’s past two reports. It is unclear, the report concludes, why the NIH chooses to “keep, feed, and care for the 139 chimpanzees at their NCCC (National Center for Chimpanzee Care). The $2 million or more spent on the chimpanzees annually would be better spent on actual medical research to benefit the American taxpayers who paid for it. “The NIH should safely relinquish the chimpanzees to animal sanctuaries, zoos, or other groups who can use private dollars for their care,” they conclude. While the report says that the nation is currently $20.49 trillion in debt, and ran a $666 billion deficit in 2017, it does point out some things that have been addressed from Federal Fumbles reports from past years. “During 2017, we’ve worked to roll back wasteful spending and a number of harmful and burdensome regulations from the two previous Federal Fumbles reports,” Sen. Lankford commented. “The outrageous federal deficit remains too high. Unfortunately, Washington, DC seems to be distracted and the deficit has started increasing again. Our $20 trillion national debt will continue to increase until we implement spending cuts, government reforms, and create a healthy economy.